Middle East Electricity (MEE) is a major show covering some 65,000 sqm and housing more than 1,600 exhibitors from 60 countries. Many of our Red Book listed clients sell into the Middle East and our presence at MEE provided a great opportunity to promote these listings, and to give support to the Red Book client who were also exhibiting. Our attendance at MEE also enabled clients to meet members of our Cables team face to face. Attending the show were Jenny Morris, Cables Certification Manager, Damien Ward, Senior Certification Manager for the Passive fire business and Ed Gaynor, Middle East Regional Manager. Our approved clients and those seeking approval are very supportive of the fact that we have a local representation to help with their enquiries. This was also an ideal opportunity for us to discuss with specifiers and manufacturers the requirements for the CE marking of cables. Product standard EN 50525 for power, control and communication cables has been published and CE marking of these products will become mandatory for those being placed on the market in Europe from 1 July 2017. 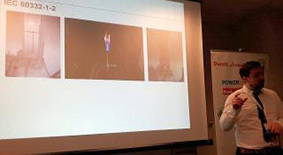 Whilst at the show we were invited by Ducab to present at one of their well-attended technical seminars. Above is Damien Ward explaining the range of LPCB cable approvals, the certification process and the services BRE Global offers for CE marking of cables. As the team were attending the show in Dubai, Oman Cables, one of our Red Book listed companies, extended an invitation to Jenny, Damien and Ed to visit their manufacturing and testing facilities in Muscat, Oman. The day prior to the show opening, their hosts took them on a tour of their new fire and mechanical testing facilities and the team were very impressed. Oman Cables warmly invited us back for the grand opening of their expanded factory later this year.